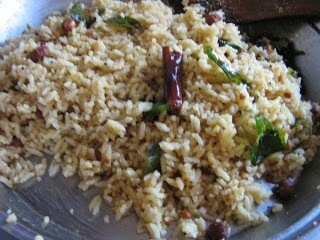 Puliogare is a variety rice which is made out of tamarind pulp. 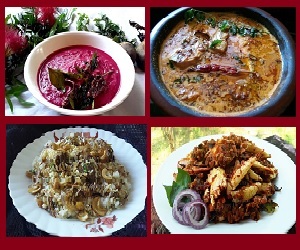 This is a famous delicacy of South India. 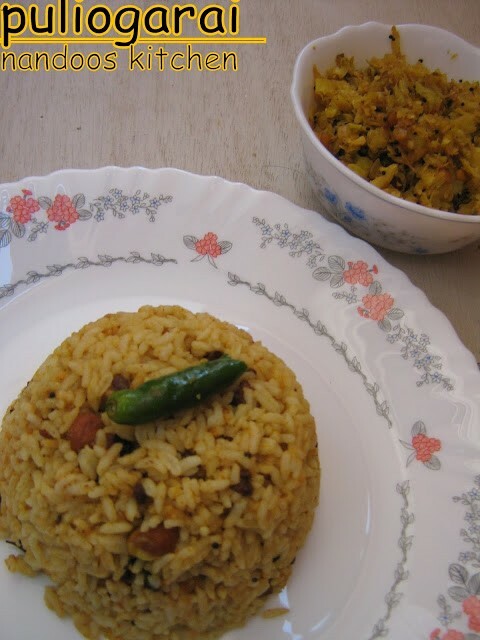 As I have already told you I was in Chennai for a few years and it was during my stay in Chennai that I learnt the process of making this wonderful rice variety. It is very easy to make and very tasty too. 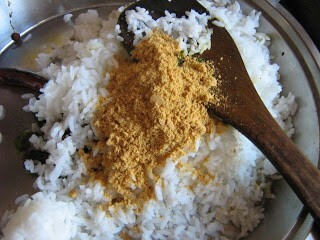 A sauce called as puli kachal (which means tamarind is mixed with other spices and boiled) is prepared which is mixed with rice along with some roasted spice powder. So while making this variety rice there are three main steps to be followed. The first one is preparing the spice powder, the second preparing puli kachal and third one is mixing every thing together. Serve it with any poriyal of your choice. Here I have served with cabbage poriyal. 1. First cook rice and keep it aside. While cooking rice add rice:water in 1:2 ratio. 2. Soak tamarind in water. Extract the juice and discard the pulp. 1. In a pan heat 1 teaspoon of oil, add fenugreek seeds. Let it become light brown in colour. 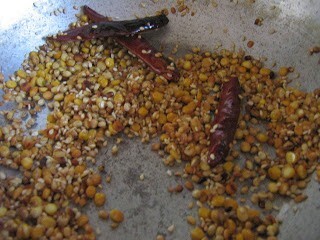 Then add channa dal (gram dal), urud dal, sauté for few seconds. Then add coriander seeds, sesame seeds and dry red chilly. Sauté all these ingredients together for a few seconds. Then turn off the stove and allow it to cool. 2. 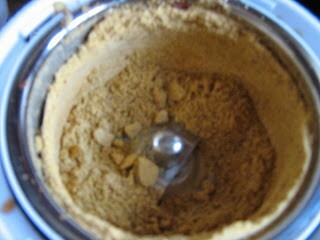 Blend the roasted ingredients in a mixer to get a fine powder. 1. 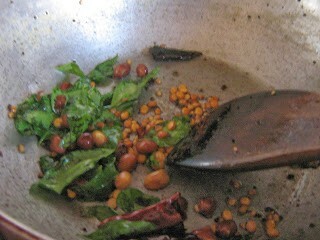 In a pan heat oil, add mustard seeds. Let it splutter. 3. 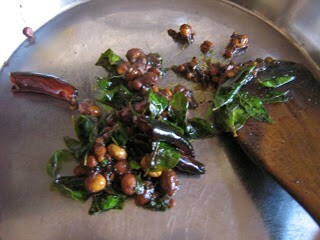 Now add dry red chilly, curry leaves, channa dal and urud dal. Sauté these ingredients for a few seconds. 3. Then add the roasted peanuts. Saute it for few more seconds. 4. 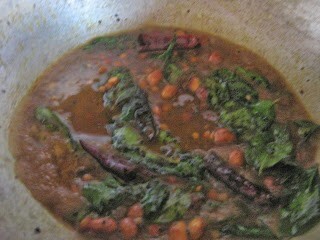 Then add asafoetida powder and turmeric powder sauté it. 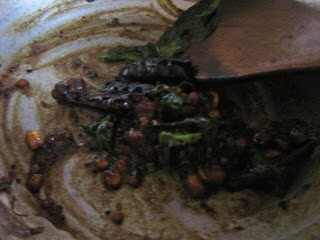 Then add the tamarind pulp. Add the required amount of salt at this stage. Let it boil for some time. Cook it till the sauce thickens and oil starts separating. Turn off the heat. 1. Add the rice to a wide mouthed bowl. 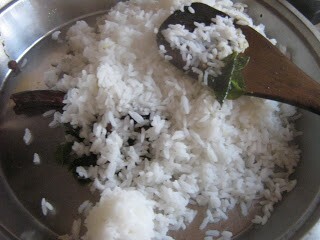 Add the required amount of pulikachal to the rice, a teaspoon of oil. Add salt if necessary. 2. Add the required quantity of spice powder also. Mix all the ingredients together. 3. Leave it for some time and then serve it.